Citation: Minami T, Ueda K, Hagiwara T. Cilia movement of ependymal cells in the third ventricular surface is inhibited by the administration of methylmercury to mouse. J Clin Exp Tox. 2017;1(1):1-6. Four cerebral ventricles exist in mammals and cerebrospinal fluid (CSF) fills the ventricles. Hydrocephalus is induced by overproduction of CSF, defective absorption of CSF, and obstruction of flow. Ependymal cells, a type of glial cell, are simple columnar epithelium cells lining the ventricles of the brain and the ventricular surface of ependymal cells is covered with motile cilia. CSF flows in one direction as all cilia beat in the same direction. This ciliary beating of ependymal cells ensures the constant flow of CSF, playing an important role in not only the maintenance of neuronal function but also the movement of neuroblasts. In addition, it is thought that abnormal ciliary beating function is associated with the development of hydrocephalus [1-4]. Methylmercury (MeHg) as a pollutant accumulates in seafood such as fish and shellfish, and is the cause of serious illnesses such as Minamata disease. People routinely take in very small amounts of MeHg from fish and/or fat stock fed fishery products. It is thought that these very small amounts of MeHg do not affect human health. However, almost 100% of MeHg in food is taken up by the body, and the main target of MeHg toxicity is the brain. The long-term effects of low-dose MeHg exposure were recently studied; MeHg can pass through the blood-brain barrier, and about 10% of MeHg taken into the body is detected in the brain. It is known that MeHg is a strong neurotoxin and acts on synapse transmission, microtubule composition, amino acid transport, and cellular migration in brain [5-8]. It is also reported that the administration of MeHg disrupts neuronal microtubule assembly as mercury binds to the thiol groups of tubulin . MeHg is pathologically reported to cause hydrocephalus [10-12]. However, which mechanism of MeHg acts to cause hydrocephalus are still unknown. In our previous report , addition of MeHg to artificial CSF solution in brain slices including the third ventricular ependymal cells decreased ciliary movement in a dose-dependent manner. As there are several reports that ciliary movement is inhibited by the decrease of intracellular ATP level, disruption of tubulin polymerization, and so on [4,14-19], it is thought that MeHg may also affect those mechanisms. However, in our previous report , we observed the ciliary movement change due to MeHg using brain slices after the extraction of mouse brains. It remained unknown whether mercury taken into the body would have a similar effect. Therefore, the aim of the present study is to establish how MeHg administered to mice would affect the ciliary movement. We have previously described the methods used for sample preparation and beat frequency analysis , although the previous study was a slice addition experiment. MeHg chloride was obtained from Fluka Chemie GmBH (Buchs, Switzerland), and dissolved in tap water. The artificial CSF solution consisted of 150 mM NaCl, 3 mM KCl, 1.3 mM CaCl2, 1.3 mM MgCl2, 10 mM HEPES, and 5.6 mM glucose (pH 7.3). Male 6-week-old ddY strain mice were obtained from Japan SLC Inc. (Hamamatsu, Japan), and kept for one week in standard housing conditions, i.e., 12:12-h cycles at 22-25°C and 40-60% humidity with food and tap water ad libitum. All animal experimental protocols were approved by the Committee for the Care and Use of Laboratory Animals at Kindai University (KASE-28-002). Each mouse was killed by cervical dislocation, and the brain was removed by opening the skull. The brain was kept at 4°C in artificial CSF solution, which was continuously bubbled with air, for 10-15 min. A coronal whole-brain slice (150 μm) including the median eminence was prepared using a vibratome (PRO 7, Dosaka EM, Kyoto, Japan). The median eminence was used as a landmark for selecting the brain slice to examine the ependymal cells lining the wall of the third ventricle. The brain slice was placed in a glass-bottom dish (35-mm with a 27-mm hole, Asahi Glass, Tokyo, Japan), fixed with a slice anchor (SHD-26/H10, Warner Instruments, Hamden, USA), and placed on the stage of an inverted microscope (CKX31, Olympus, Tokyo, Japan). Ciliary movement was observed using a x 40 objective lens. The ciliary beat frequency (CBF) was recorded using a highspeed digital camera (Exlim EX-FC 100, Casio, Tokyo, Japan) at 210 frames per second (fps). The digital data were replayed frame-by-frame or at the ordinary speed of 30 fps on a conventional computer suing the software Area61 VideoBrowser. Artificial CSF solution was applied to the brain slice by continuous perfusion at 2 ml/sec and 35.5 ± 0.5°C. We counted ten cilia for CBF every ten minutes during 30 minutes after the slice was placed on the stage of the microscope, and calculated the ciliary beat frequency after all data obtained during 30 minutes were averaged. Mice were given drinking water containing MeHg continuously for 19 days and the relationship between the dose of MeHg and CBF was observed. Ten mg/L, 20 mg/L, or 40 mg/L of MeHg were dissolved in tap water and given to mice for 19 days modified from the methods of Carvalho et al. and Franco et al. . In the control group, mice were given tap water without MeHg for 19 days. Body weight, feed intake, and drinking volume were checked every day. Each mouse was killed by cervical dislocation at day 19, and CBF was measured. To establish the relationship between duration of administration of MeHg and the CBF, mice were given drinking water containing 20 mg/L MeHg, killed by cervical dislocation at day 4, day 8, or day 12, and CBF was measured. CBF of the control group was observed in mice before administration of MeHg. Mice were given drinking water including 20 mg/L MeHg consecutively for 19 days. Then, after changing back to tap water without MeHg for 10 days, 20 days, or 30 days, the recovery of CBF was observed. In the control group, mice were kept on tap water without MeHg for 49 days, while mice kept on tap water including MeHg for 19 days served as a MeHg-alone group. Frontal lobes were collected from mice when CBF was observed, and after measuring wet weight were stored at -20 °C until the measurement of mercury content. Two ml of conc. nitric acid was added to the tissue and kept for two weeks at room temperature for dissolution. The total volume was adjusted to 10 ml by adding ultrapure water (Direct-Q UV3, EMD Millipore Co., Tokyo, Japan). After filtration using a 0.22 μm syringe-driven filter unit (Millex-GV PVDF, EMD Millipore Co., Tokyo, Japan), the total mercury content was measured by using Inductively Coupled Plasma Optical Emission Spectrometry (ICP-OES, iCAP7600 Duo, Thermo Fisher Scientific Japan, Kanagawa, Japan). The detection limit was set at 25 ng/ml, and values lower than the limit were expressed as "Not Detected (ND)". Data are shown as the mean ± standard deviation (SD). Data were analyzed using one-way analysis of variance with a Scheffe post-test comparison with the control group or MeHgalone group. Significant difference was shown as p<0.05 and p<0.01. Ependymal cilia exhibit stable beating for 70 minutes after preparation of slices, as shown in our previous report . We therefore observed CBF during 30 minutes after the preparation of slices as described in Materials and Methods. The physiological parameters of mice after drinking MeHg solution are given in Figure 1. As shown in Figure 1(a), the body weight of mice drinking 40 mg/L MeHg was always lower than those of the other three groups, although there were no significant differences between the 40 mg/L group and the other three groups. Mouse body weight at 19 days increased 7.6 ± 3.3 g in the control group, 7.7 ± 1.8 g in 10 mg/L group, 8.0 ± 1.9 g in 20 mg/L group, and 5.2 ± 1.4 g in 40 mg/L group, respectively. There was no significant difference between the four groups in daily feed intake as shown in Figure 1b, but the volume of feed intake in the 40 mg/L group fell gradually compared with the other three groups. When the daily volume of drinking water was measured, the level of the 40 mg/L group was always lower in comparison with the other three groups, and the average volume of the 40 mg/L group was significantly lower than that of the control group as shown in Figure 1c. Figure 1: Effect of drinking water containing MeHg for 19 days on physiological parameters. (a) Daily body weight. (b) Daily feed intake. (c) Average water daily intake volume. Control group was given tap water without MeHg for 19 days. Mice were given tap water including 10 mg/L MeHg (10 mg/L group), 20 mg/L MeHg (20 mg/L group), and 40 mg/L MeHg (40 mg/L group) for 19 days ad libitum. Mean ± S.D. More than three mice were used in each group. **p<0.01 vs. control group. 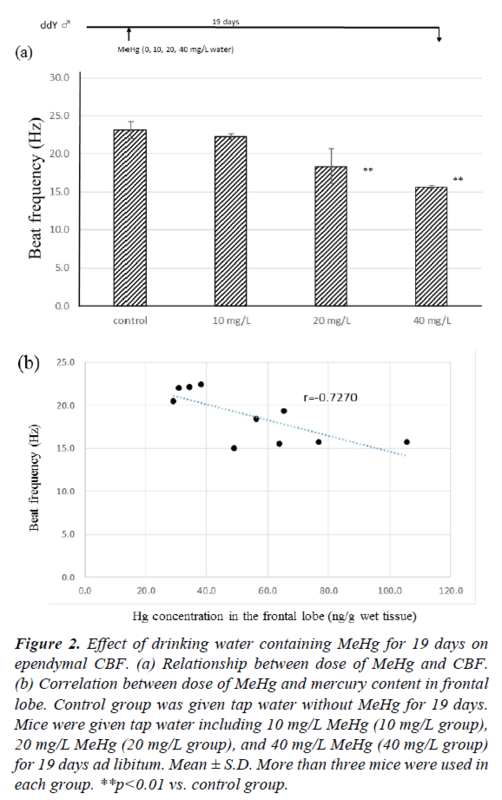 Figure 2a shows the effect of drinking water including MeHg for 19 days on ependymal CBF. In the tap water control group, CBF at 19 days was 23.16 ± 1.07 Hz. There was no significant difference between the control and 10 mg/L MeHg groups (22.24 ± 0.24 Hz). However, the CBFs of 20 mg/L and 40 mg/L MeHg groups were 18.38 ± 2.33 Hz and 15.64 ± 0.19 Hz, respectively, and CBF of both groups was significantly lower than the control group (p<0.01). The CBF decreased compared to controls in a dose-dependent manner. The relationship between CBF and total mercury content in the frontal lobe is shown in Figure 2b. In the control group, no mercury contents were detected in the frontal lobe (below 20 ng/ml), but after drinking water containing MeHg for 19 days, mercury was detected in the frontal lobe for all mice. There was negative relationship between CBF and total mercury content after drinking MeHg for 19 days (r=-0.727, p<0.01). Figure 2: Effect of drinking water containing MeHg for 19 days on ependymal CBF. (a) Relationship between dose of MeHg and CBF. (b) Correlation between dose of MeHg and mercury content in frontal lobe. Control group was given tap water without MeHg for 19 days. Mice were given tap water including 10 mg/L MeHg (10 mg/L group), 20 mg/L MeHg (20 mg/L group), and 40 mg/L MeHg (40 mg/L group) for 19 days ad libitum. Mean ± S.D. More than three mice were used in each group. **p<0.01 vs. control group. To establish how many days of MeHg administration are needed for a decrease in CBF, 20 mg/L MeHg was given to mice for 4, 8, and 12 days. As shown in Figure 3, when MeHg was taken for 4 days, CBF significantly decreased in comparison with the mice before MeHg administration (p<0.05). There was no significant difference between control and 8-day administration groups, because dispersion was large. However, a significant difference was observed between control and 12-days administration groups (p<0.01). In addition, mercury content in the frontal lobe was 34.9 ± 5.2 μg/g wet weight in the 4-days group, 50.2 ± 16.2 μg/g in the 8-days group, and 63.0 ± 22.4 μg/g in the 12-days group. Therefore, CBF decreased time-dependently after 4-days of continuous administration of MeHg. This indicates that the decrease of CBF depends on the increase of mercury content in the brain. Figure 3: Effect of duration of administration of MeHg on CBF. MeHg (20 mg/L) was given freely to mice. CBF was measured at days 0, 4, 8, and 12. Day 0 mice were not given MeHg drinking water. Mean ± S.D. More than three mice were used in each group. *p<0.05 and **p<0.01 vs. Day 0 group. The recovery effect of CBF after discontinuing MeHg intake is shown in Figure 4. When control group mice were given tap water instead of MeHg (20 mg/L) for 19 days, the CBF of mice previously given MeHg (20 mg/L) for 19 days (MeHg alone group) decreased to 79.4 ± 10.1% compared with control group (p<0.05). After mice had taken MeHg for 19 days, the drinking water was changed for tap water without MeHg. CBF was 89.4 ± 8.4% compared with control mice ten days later (10-days group), and there was no significant difference between the MeHg-alone group and the 10-days group. CBF of mice given tap water both for 20 days (20-days group) and for 30 days (30- days group) was observed to be 106.5 ± 2.0% and 97.6 ± 8.4% in comparison with the control group, respectively, and there was a significant difference between the 20-days and 30-days groups and the MeHg-alone group. Figure 4: Recovery effect after taking drinking water including MeHg for 19 days. Control group was given tap water without MeHg for 19 days. MeHg-alone group was given tap water with MeHg (20 mg/L) for 19 days. 10-days group, 20-days group, and 30-days group were given tap water with MeHg (20 mg/L) for 19 days followed by drinking water without MeHg for 10 days, for 20 days, and for 30 days, respectively. Mean ± S.D. More than three mice were used in each group. *p<0.05 vs. control group. #p<0.05 and ##p<0.01 vs. MeHg alone group. Mercury content in the frontal lobe of the MeHg alone group was 49.9 ± 15.4 μg/g, that for the 10-days group was 23.4 ± 10.6 μg/g, and in the 20-days group 19.9 ± 13.8 μg/g. Furthermore, the mercury contents of four of five mice in the 30-days group were lower than the detection limit. CSF percolates from the choroid plexus, circulates through the subarachnoid cavity and is absorbed in venous blood from the superior sagittal sinus. By the ciliary movement of ependymal cells lining the ventricle wall, CSF flows in one direction from the lateral ventricle to the fourth ventricle. Hydrocephalus occurs due to the overproduction of CSF, absorption disorder of CSF, or closedown of the CSF circulation system. A decrease of ependymal ciliary movement is strongly associated with the hydrocephalus induced by closedown of the CSF circulation system [1,2]. Lewis et al. reported that the mutant mouse that lacks Growth Arrest Specific 8 (Gas 8) located in the microtubule on motile cilia demonstrates decreased ciliary movement and hydrocephalus. When silicone oil or kaolin suspension was injected into the cisterna magna, ciliary movement was inhibited and hydrocephalus occurred . Therefore, it is the clear that the decrease of ciliary movement is related to the induction of hydrocephalus. MeHg is known as the causative chemical of Minamata disease. It passes through the blood-brain barrier and is responsible for various central functional disorders. Choi et al. reported that hydrocephalus was observed in 15-25% of postnatal mice born from pregnant mice that had received MeHg injection between E14 and E17 of gestation, and mercury was detected in the ependymal cells of the postnatal mice. Silva Sieger et al. reported a man with chronic mercury poisoning whose mercury level in blood was 61.5 μg/L; they observed hydrocephalus and stenosis of the aqueduct of Sylvius. Furthermore, in the clinically follow-up of Minamata disease children, it is reported that two cases were hydrocephalus . From these reports, MeHg affects the ciliary movement of the ependymal cells and it is suggested that MeHg induces hydrocephalus. The cilia are composed of microtubules containing dynein arms and an ATPase-dependent reaction is needed to generate ciliary movement . Chang and Hartmann  observed the distribution of mercury in the nervous system using electron microscopy after MeHg administration and reported that mercury is likely to be detected in mitochondria. In addition, when 20 mg/L of MeHg was drunk to rat every day, mercury was detected from day 16 in the Allocortex parts and from day 20 in Lamina III in the Isocortex parts of cerebral cortex, and from day 20 in ependymal cells . It is thought that the administered mercury accumulates at every part of the brain depending on the dose and the number of days of MeHg administration. And mitochondrial dysfunction in ependymal cells induced by MeHg may cause the reduction of CBF. In our previous report , we observed that MeHg induced a decrease of ciliary movement using brain slices directly added with MeHg by adding to artificial CSF solution, suggesting a direct effect of MeHg on ciliary movement. In addition, stable ciliary movement was observed for a long time after brain slices were prepared. This time we observed the effects of MeHg on ciliary movement using mouse brain in which mouse was daily drunk with MeHg. 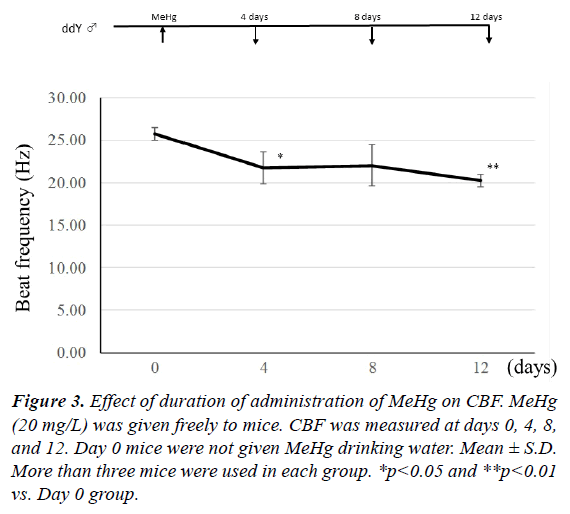 As shown in both Figure 2b and other results measuring Hg concentration in the frontal lobes, CBF decreased dose-dependently when mice drank water containing MeHg for 19 days, and the increase of mercury level in the brain seemed to be one cause of the decreased CBF. From the drinking volume and body weight in our experiments, mice orally took 2.5 ± 0.3 mg MeHg/kg/day in the 10 mg/L MeHg-drinking group, 4.3 ± 0.5 mg MeHg/kg/day in the 20 mg/L MeHg-drinking group, and 7.6 ± 0.6 mg MeHg/kg/day in the 40 mg/L MeHg-drinking group. The MeHg concentration was not reflected in physiological parameters such as body weight and drinking volume, but CBF decreased on day 4 after continuously drinking MeHg water (Figure 3). However, when 2 mg/kg of MeHg was intraperitoneally injected once, CBF did not differ from the control group 24 hours after the injection (data not shown). A minimum dose and time may be required for the CBF to decrease. Furthermore, our previous report  indicated that MeHg had an irreversible influence on CBF in brain slices, but CBF was restored gradually when the intake of MeHg drinking water was stopped (Figure 4). It is suggested that the action of MeHg on CBF is reversible in vivo system unlike the slice experiment. The decrease of CBF may depend on the increase of mercury in the cells. According to the results of the present study, it is concluded that MeHg administered to mice induces a decrease of ciliary movement of third ventricle ependymal cells. This decrease of CBF induced by MeHg may be found at early time, gradually recovers after stopping the administration, and the decrease of CBF depends on the increase of mercury content in the brain. It is speculated that the occurrence of hydrocephalus caused by MeHg is related to the decrease of ciliary movement of ependymal cells. Authors declare that they have no potential competing financial interests with other people or organizations. Go KG, Stokroos I, Blaauw EH, et al. Changes of venticular ependyma and choroid plexus in experimental hydrocephalus, as observed by scanning electron microscopy. Acta Neuropath 1976;34:55-64. Nakamura Y, Sato K. Role of disturbance of ependymal ciliary movement in development of hydrocephalus in rats. Childs Nerv Syst 1993;9:65-71. Hirst RA, Sikand KS, Rutman A, et al. Relative roles of pneumolysin and hydrogen peroxide from Streptococcus pneumoniae in inhibition of ependymal ciliary beat frequency. Infection Immunity 2000;68:1557-62. Mukk?nen KS, Hirst RA, Laitinen JT, et al. PACAP27 regulates ciliary function in primary cultures of rat brain ependymal cells. Neuropeptides 2008;42:633-40. Zahir F, Rizwi SJ, Haq SK, et al. Low dose mercury toxicity and human health. Environ Toxicol Pharmacol 2005;20:351-60. Montgomery KS, Mackey J, Thuett K, et al. Chronic, low-dose prenatal exposure to methylmercury impairs motor and mnemonic function in adult C57/B6 mice. Behavioural Brain Res 2008;191:55-61. Castoldi AF, Onishchenkko N, Johansson C, et al. Neurodevelopmental toxicity of methylmercury: Laboratory animal data and their contribution to human risk assessment. Regulatory Toxicol Pharmacol 2008;51:215-29. Ceccatelli S, Daré E, Moors M. Methylmercury-induced neurotoxicity and apoptosis. Chemico-Biological Interactions 2010;188:301-8. Clarkson T. Mercury: major issues in environmental health. Environ Health Perspect 1992;100:31-38. Kutscher CL, Sembrat M, Kutscher CS, et al. Effects of the high methylmercury dose used in the collaborative behavioral teratology study on brain anatomy. Neurobehavioral Toxicol Teratol 1985;7:775-77. Choi BH, Kim RC, Peckham NH. Hydrocephalus following prenatal methylmercury poisoning. Acta Neuropathol 1988;75:325-30. Inouye M, Kajiwara Y. Strain difference of the mouse in manifestation of hydrocephalus following prenatal methylmercury exposure. Teratology 1990;41:205-10. Yoshida S, Matsumoto S, Kanchika T, et al. The organic mercury compounds, methylmercury and ethylmercury, inhibited ciliary movement of ventricular ependymal cells in the mouse brain around the concentrations reported for human poisoning. NeuroToxicol 2016;57:69-74. Nelson DJ, Wright EM. The distribution, activity, and function of the cilia in the frog brain. J Physiol 1974;243:63-78. Hirst RA, Gosai B, Rutman A, et al. Streptococcus pneumoniae damages the ciliated ependyma of the brain during meningitis. Infection Immunity 2003;71:6095-100. Takaki E, Fujimoto M, Nakahari T, et al. Heat shock transcription factor 1 is required for maintenance of ciliary beating in mice. J Biol Chem 2007;282:37285-92. M?nkk?nen KS, Hakum?ki JM, Hirst RA, et al. Intracerebroventricular antisense knockdown of Gαi2 results in ciliary stasis and ventricular dilatation in the rat. BMC Neurosci 2007;8:26. Hirst RA, Rutman A, O'Callaghan C. Hydrogen peroxide at a concentration used during neurosurgery disrupts ciliary function and causes extensive damage to the ciliated ependyma of the brain. Childs Nerv Syst 2009;25:559-61. Genzen JR, Yang D, Ravid K, et al. Activation of adenosine A2B receptors enhances ciliary beat frequency in mouse lateral ventricle ependymal cells. Cerebrospinal Fluid Res 2009;6:15. Carvalho MC, Franco JL, Ghizoni H, et al. Effect of 2,3-dimercapto-1-propanesulfonic acid (DMPS) on methylmercury-induced locomotor deficits and cerebellar toxicity in mice. Toxicology 2007;239:195-203. Franco JL, Posser T, Dunkley PR, et al. Methylmercury neurotoxicity is associated with inhibition of the antioxidant enzyme glutathione peroxidase. Free Radical Biol Med 2009;47:449-57. Lewis WR, Malarkey EB, Tritschler D, et al. Mutation of growth arrest specific 8 reveals a role in motile cilia function and human disease. Plos Genetics 2016;12:e1006220. Silva Sieger FA, Díaz Slva GA, Ardila GP, et al. Mercury chronic toxicity might be associated to some cases of hydrocephalus in adult humans? Medical Hypotheses 2012;79:13-16. Mohri J, Inaba K, Ishijima S, et al. Tubulin-dynein system in flagellar and ciliary movement. Proc Jpn Acad Ser B 2012;88:307-415. Chang LW, Hartmann HA. Electron microscopic histochemical study on the localization and distribution of mercury in the nervous system after mercury intoxication. Experimental Neurology 1972;35:122-37. Møller-Madsen B. Localization of mercury in CNS of the rat. III. Oral administration of methylmercuric chloride. Fundamental and Applied Toxicology 1991;16:172-87.